On Friday we finally got our hands on Octopath Traveler, one of the first games announced for the Nintendo Switch way back in the January 2017 presentation. While we don’t have too much data on the game’s sales so far, word-of-mouth suggests its been incredibly successful over it’s launch weekend. 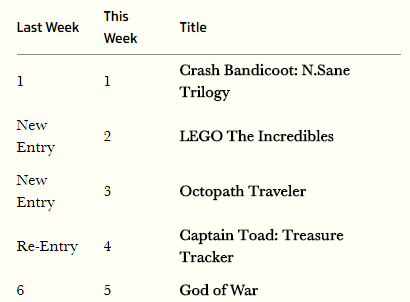 This is backed up by the latest report from Gamesindustry.biz, which reveals that the RPG hit third place on the UK sales charts, just under multiplatform hits Crash Bandicoot and Lego The Incredibles. More notably, however, the publication reveals that Octopath has sold almost double the amount its spiritual predecessor, Bravely Default, achieved. Considering that game itself was lauded as a success back in the day, it’s definitely a good sign! Here’s hoping the success of Octopath Traveler leads to more classic RPGs in the near future!